Pennysylvania cherry and rosewood jewelry armoire. Please inquire for delivery time. Spectacular curly cherry figure with genuine rosewood cocobolo accents. A very large cabinet that will hold many decades of jewelry collecting. 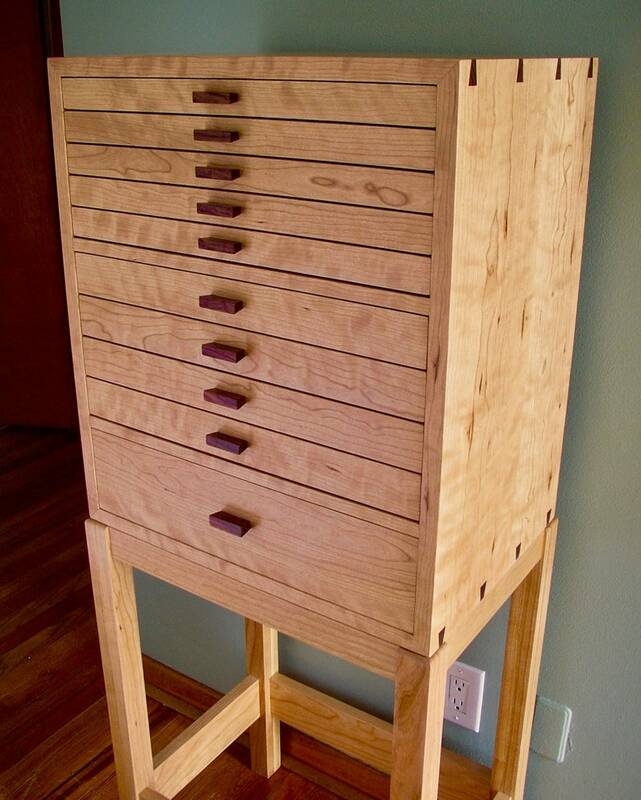 Five 1.5" drawers, 4-2" drawers, and one 4" drawer. 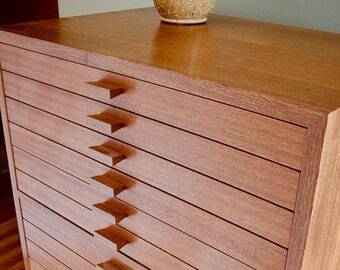 The dovetailed drawers are fitted with solid ash dividers in a variety of sizes, from 2" x 2" spaces to 4" x 6" spaces, and are lined with black cotton velveteen. Armoire measures 20" wide x 23" ht x 15" deep. Mitered case construction with four dovetail keys in each corner. Solid cherry frame and panel back. Finished with multiple coats of clear shellac, hand rubbed to a satin finish and topped with paste wax. Stand height is 27"; overall height with stand is 50." Named after the cat who moved into my shop during the construction of the original prototype. Worldwide shipping is available, contact me for a quote.